One thing I’ve learned is that what I think a cutting board should be is not always shared by other people with less active kitchens than we have. 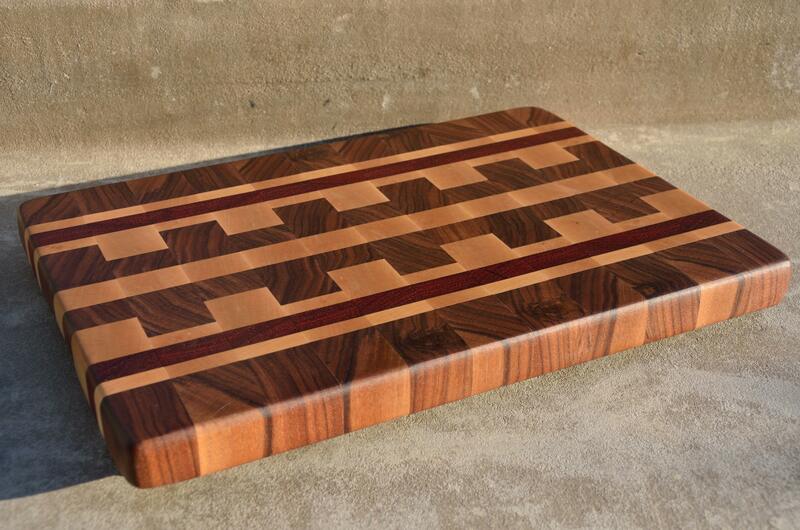 That’s OK. I’ve learned to make cutting boards in all sizes … and new shapes are coming, too! I believe a cutting board should be large enough for the task at hand (and most kitchens will need at least two boards: one for the chef and one for the sous chef, their assistant). These boards range from 8″ x 12″ x 7/8″ to 16″ x 24″ x 1-1/2″. If you don’t see the size you would like … please let me know! Prices vary with the size of the board, the woods selected, and the complexity of the construction. As shown, these boards cost $60 – $300. # 14-19. Black Walnut end grain. 12″ x 20″ x 1-1/2″. # 14-07. Black Walnut and Hard Maple edge grain. 12″ x 20″ x 1-1/2″. # 14-06. Hard Maple edge grain. 16″ diameter with a 20* cant on the outer edge. 16″ x 1-1/2″. # 14-05. Goncalo Alves, Hard Maple and Cherry edge grain. 12″ x 18″ x 1-1/4″. # 13-08. Alley’s cutting board. Goncalo Alves, Jatoba, Honey Locust, Walnut and Cherry. 16″ x 22″ x 1-1/4″. # 13-03. Velda’s cutting board and cheese board set. Goncalo Alves, Jatoba, Black Walnut, Cherry and Honey Locust. Cutting Board is 16″ x 22″ x 1-1/4″. Cheese boards are 9″ x 11″ x 1″. # 13-02. Commissioned piece. Purpleheart, Padauk, Cherry, Hard Maple and Canarywood edge grain. 12″ x 16″ x 1-1/4″. # 13-01. The Wood Whisperer’s design. One is Black Walnut & Yellowheart; the other is Black Walnut & Hard Maple. Edge grain. 12″ x 18″ x 1-1/4″. These are BEAUTIFUL! We just met you at the Tehachapi Mountain Festival and my husband does woodworking. Thank you for coming and displaying your artwork. Hopefully you will come next year! Thanks so much, Bethany! We had a great time at the Mountain Festival, and we will definitely return in 2016!